Howard Kelford & DuBois LLP takes full responsibility for the personal information we collect and hold. To ensure this accountability, we have developed this policy, and trained our lawyers and support staff about our policies and practices. Why Does Howard Kelford & DuBois LLP Need Personal Information? Howard Kelford & DuBois LLP provides legal services to a wide range of clients. Unfortunately we can only provide these services if you provide Personal Information to us. 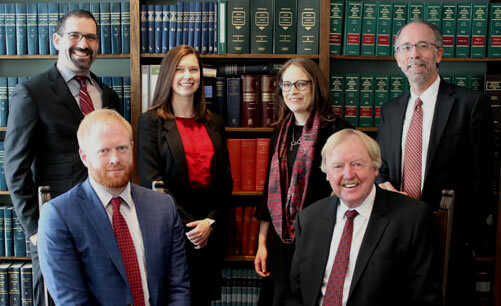 We do collect e-mail and mailing addresses for the sole purpose of including you in any direct marketing activities of Howard Kelford & DuBois LLP. If you tell us that you do not wish to receive any information from us about our services or new developments in the law, we will remove your name from our list. Howard Kelford & DuBois LLP does not sell, trade, or exchange for consideration any Personal Information that it has obtained on an individual or organization. When we engage expert witnesses on your behalf. When we retain other law firms in other jurisdictions, on your behalf. If at any time you can establish that the information we hold is not accurate, complete and up to date, Howard Kelford & DuBois LLP will take reasonable steps to correct it. While every measure is taken to respect your privacy, we would like to remind you that in providing personal information to Howard Kelford & DuBois LLP, there is no method of transmitting or storing data that is completely secure. E-mail, mail, telephone calls, faxes and transmissions over the Internet are all susceptible to misrouting, possible loss, interception and misuse of the information being transmitted or communicated. Information relates to existing or anticipated legal proceedings against you. When granting you access would have an unreasonable impact on other people’s privacy. When to do so would prejudice negotiations with you. To protect the firm’s rights and property. Howard Kelford & DuBois LLP may make amendments to this policy from time to time in accordance with any changes in the way in which it handles personal information. This policy has been in effect since January 1st, 2004 with no further amendments. If you apply to Howard Kelford & DuBois LLP for a job, we need to consider the personal information you have provided as part of our review process. Any resumes which we retain will be held in accordance with our privacy procedures for employee records. For an emergency that threatens an individual’s life, health or security. The use is clearly in the individual’s interest and consent is not available in a timely way. Consent from the individual has been obtained. Any questions concerning this policy should be directed to the professional with whom he or she has had contact; the Managing Partner of Howard Kelford & DuBois LLP at 613 283 6772. If you are not satisfied with the response to your inquiry, you may contact the Privacy Commissioner of Canada at 112 Kent St, Ottawa, Ontario K1A 1H3 or phone 1-800-282-1376.